Past “Rabbitville” exhibition at Sparks Gallery in San Diego, CA. 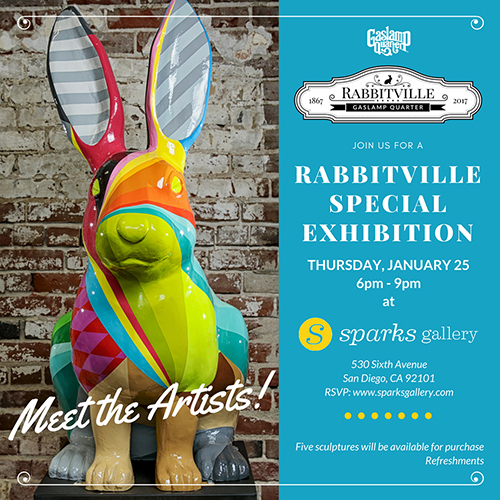 SAN DIEGO, CA: The Gaslamp Quarter Association and Sparks gallery, 530 Sixth Avenue, are pleased to announce a special exhibition of ten fiberglass rabbit statues and their artists on Thursday, January 25th from 6PM-9PM. The seven-foot-tall rabbits were commissioned in May 2017 to commemorate the 150th Anniversary of the Gaslamp Quarter’s original settlement. The reception will have ten of the fifteen sculptures on display, the artists who created them, refreshments, and an appearance of an exotic live rabbit from the San Diego House Rabbit Society. 150 years ago, the area that is now the Gaslamp Quarter was jokingly nicknamed, “Rabbitville” after its chief inhabitants. The “Rabbitville” exhibition honors the pioneering spirit of legendary founder, Alonzo Horton, who transformed Rabbitville into modern San Diego. Local artists who have participated in the creation of these unique sculptures are, Erick Diaz, Carly Ealey, Matt Forderer, Mario Herbelin-Canelas, Tasha Hobbs, Monty Montgomery, Rebecca Nuvoletta, Kelly Schott, Lee Sie, Sarah Soward, Steven Van, Siks 1, John Wismont, and the staff at Warner Bros. Television marketing division. The Gaslamp Quarter Association is also partnering with Sparks Gallery for this event. Sparks Gallery has not only restored the 1887 Sterling Hardware Building, but also was an integral part in submitting artists to be considered for this historic public art project. RSVP on the gallery’s website, https://sparksgallery.com/events/rabbitville-pop-exhibition-artists-reception or call 619-696-1416.